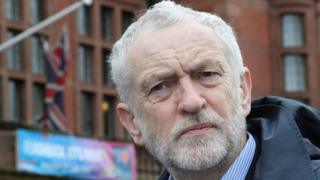 Jeremy Corbyn has expressed "sincere regret" at failing to look more closely at an allegedly anti-Semitic mural in London before questioning its removal. The Labour leader has been criticised for responding to a Facebook post by street artist, Mear One, in 2012, which asked why the image faced destruction. Mr Corbyn had written: "Why? You are in good company" - but has now said the image was "deeply disturbing". The mural, "Freedom of Humanity", was removed from East London in 2012. "I wholeheartedly support its removal," Mr Corbyn said. Labour MP Luciana Berger - who highlighted the post on Twitter - called Mr Corbyn's response "wholly inadequate". She said: "It fails to understand on any level the hurt and anguish felt about anti-Semitism. I will be raising this further." In the post from October 2012, the Labour leader appeared to oppose the mural's removal - by comparing it to Diego Rivera's "Man at the Crossroads", which the US Rockefeller family covered over because it featured a picture of Lenin. In a statement, Mr Corbyn said he had intended to make a "general comment" about the removal of public art on the grounds of freedom of speech. He added: "I sincerely regret that I did not look more closely at the image I was commenting on, the contents of which are deeply disturbing and anti-Semitic. "I am opposed to the production of anti-Semitic material of any kind, and the defence of free speech cannot be used as a justification for the promotion of anti-Semitism in any form." Mear One - whose real name is Kalen Ockerman - has denied being anti-Semitic, saying the mural was about "class and privilege".